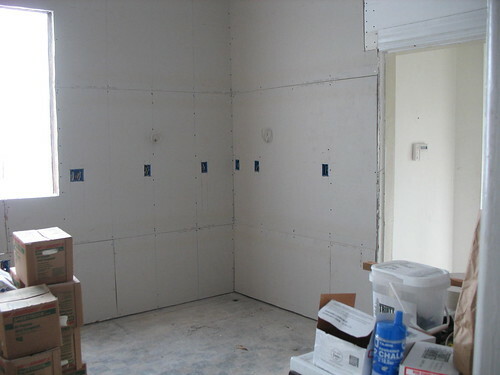 House Adventures: drywall! sheetrock! Whatever! IMG_2486.JPG, originally uploaded by berkeleygal77. Drywall, sheetrock, whatever you call it, it's up in most of the house! This week, the workers will be plastering the cracks and finishing the drywall. I have also chosen what color of Marmoleum I want for the floors in the kitchen, pantry, and back hallway. And the granite countertops. I'm pretty close to deciding on the kitchen cabinets. Will I tell you about those options - no! You get to wait until it's all installed. :-) Have also started to think about interior paint colors. granite countertops sound sooo nice! looking good!